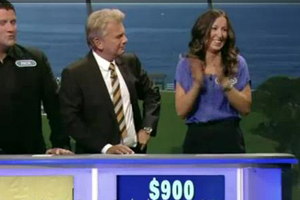 The contestant, Caitlin Burke, stunned “The Wheel of Fortune” host, Pat Salak, by guessing a 27-letter clue with just one letter (“L”) showing. Burke immediately guessed “I’ve got a good feeling about this”. Sajak said it was the best he’s ever seen on the show. He said “Is it just me, or was that the most amazing solve we've ever had?" The answer won Burke $900 and a Caribbean vacation. In fact Burke was so confident that she knew the answer to the clue before the first letter was uncovered, she told the New York Post, that she considered answering before choosing a letter but didn’t want to annoy the producers.